Loreal Tecni. Loreal Efassor Farbabzug 28 g. Comair Color Augenbrauen- und Wimpernfarbe naturbraun 15 ml. Comair Color Augenbrauen- und Wimpernfarbe tiefschwarz 15 ml. RefectoCil A/W-Farbe 2 blauschwarz 15 ml Augenbrauenfarbe Wimpernfarbe. L'Oreal Tecni Art Hollywood Waves Spiral Queen Nourishing Mousse adds contour and definition to waves and curls. Its nourishing formula adds a soft touch and shine and does not require any retouch. No exceptions. The styling series tecni.art combines latest technology with boundless creativity. Trendy styling between fashion and modernity. Content 250 ml. Batteries are the symbol of a crossed-out dustbin (s. u.) marked. Size: 6.8 oz/ 193g each x 2. Line: BOOST IT. Our powerful aerated foam amplifies hair strands for a denser feel with touchable bounce. Strong hold 3. Hold Strength Strong Hold. UPC Does not apply. Original or Reproduction Original. Applty to towel-dried hair. Shake the can well and hold it upright. Product Features Copy Right 2017 All Right Reserved by HairSkinBeauty. • Up to 48 hours. Enriched with silk micro fibres. Natural touch & glossy shine on your hairs. Apply to towel-dried hair. Release 1-2 mandarin sized amounts into hands. Spread evenly through hair with a comb or fingers and blow-dry in. Hold factor: 5 - extra strong hold. Product Features Copy Right 2017 All Right Reserved by HairSkinBeauty. Shake the can well before use. Apply on towel-dried hair. Using a comb apply directly on the roots and through the lengths. Blow-dry with fingers or a round brush. The hold and definition of a mousse with the care of a delicate cream. Long-lasting hold and body. Soft feel, lightweight and non-greasy. The hold and definition of a mousse with the care of a delicate cream. The hold and definition of a mousse with the care of a delicate cream. If there's a problem, just let us know and we fix it. Content - 200 ml. If there's a problem, just let us know and we fix it. 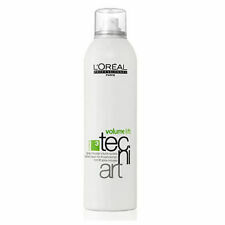 L'oreal tecniart hollywood queen spiral waves foam 200 ml with nourishing action to define curls and waves. Leaving a spacious effect, shiny curls. The unique texture to ensure uniform application. If there's a problem, just let us know and we fix it. An exclusive and original product from L'Oreal. Want to enhance your image and highlight your beauty?. Then theStyling Mousse Tecni Art L'Oreal Expert Professionnel will help you to achieve your goals! Quick view Want to enhance your image and highlight your beauty?. Rebel Push Up represents L’Oréal’s first micro powder stabiliser combined with a uniquely formulated mousse, creating our texturizing powder-in-mousse. Powder-in-mousse is perfect for achieving volumious styles with the undone texture of a powder. Loreal Efassor color 28 g. L ' Oréal TECNI. Push-Up type wild Styler rebel 250 ml. Take the ultimate Beehive look of the 60s with modern ease: incredible stand at the hairline and informal texture with resistant grip.